A three tiered cake has the classic "wedding" look but is not unmanageable. It's big enough to get creative with your design, but not so large that you are worried about separating layers for cutting. Whether you want a traditional look or something more modern, this is the perfect size for any wedding style. Pastel roses anchor a three tier cake and tie into the cake topper that features pastel pink, white, cream, and lavendar roses. The middle and top tiers have small pearls surrounding the bottom of each layer to add elegance without fuss. This cake is perfect for a spring wedding, fairy themed wedding, or garden wedding. Three tiers makes a cake a classic size but it doesn't mean it has to be fancy. Decorate a cake for a country wedding with pale blue ribbon around the bottom tiers, pink fondant blossoms, and accent with raffia. A small heart topper completes this simple yet lovely cake that is perfect for a country, barn, or backyard wedding. Cover a three tier cake in marbled fondant. Cut gold fondant out to resemble icing dripping down the cake sides. Arrange cakes so the middle tier's drips are on the opposite side. Add a couple flowers to accent the cake and top it off. This cake is perfect for an artsy couple who are planning a wedding with modern flair. The tiers in your cake don't need to be the same shape. Sandwich a round or square cake between the opposite shapes for a stand-out cake. The deep blue hydrangeas that top this cake stand out against the white base and gold detailing. Select this cake for an upscale wedding in a ballroom or events center. "Naked" wedding cakes are modern and trendy. They are frosted so lightly, you can see the cake layers and filling between. If you don't want to commit to having that much showing through, go with a semi-naked cake that only has spots of the cake peaking out. Accent with a few flowers or berries at a country wedding. A classic white three tier cake is one that can work for virtually any wedding formality. Select buttercream or fondant and add small dots and gum paste roses to each tier and top. It's the right choice for anyone, but especially traditional couples who want a cake that won't go out of style. It would be perfect for a number of religious receptions, too. Ombre cakes are visually interesting as the color gradually fades to white from the darkest shade at the bottom of first cake tier. It's a great way to incorporate color into your three tiered wedding cake if you don't want a bold statement. Consider adding a second element, like ruffles, to enhance the look across the layers. Depending on your starting color, it's a nice seasonal effect and looks great at an outdoor event. Skip traditional square and round layers in your three tier wedding cake and instead select a unique wedding cake shape, such as hexagon. This stands out even more by using yellow instead of white as the frosting base. Add orchids instead of roses if you're having a tropical wedding or hosting at a botanical garden. Cakes with columns are retro today. To keep your cake from looking outdated, separate just the top tier from the bottom two, stacking them together instead. Frost with buttercream, adding a few small dots and borders around the top and bottom of each tier. A few flowers finish this design. Select it if you want a traditional wedding cake or are hosting a retro or vintage wedding theme. Not all cakes need to be decorating using fondant, gum paste, frosting, or fresh flowers. 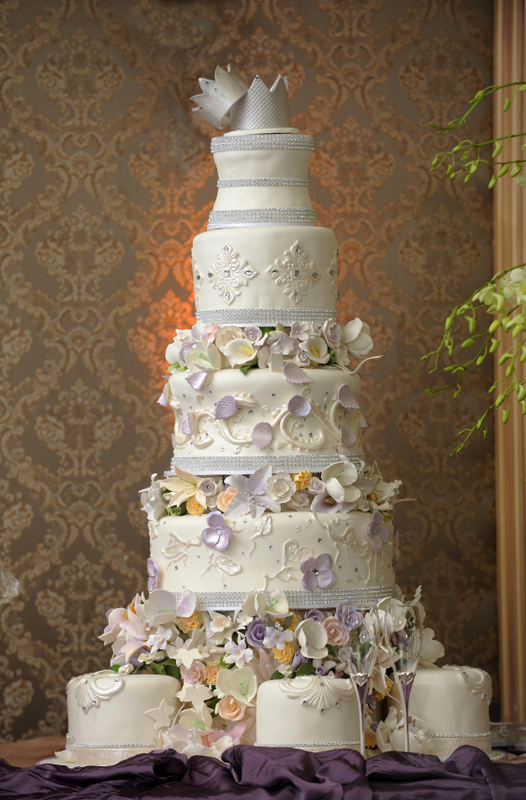 Instead, ask the baker to hand paint your cake design onto each of the tiers. This artful look is lovely at a vintage wedding or one held in a garden. Anchor the designs using ribbon around the base of each tier. Swap out the basic white or colored ribbon for one featuring rhinestones. When paired with a white cake, you get a luxurious design. If your cake is colorful, it makes the cake bold and bright. Choose cakes with some rhinestones and sparkles for an elegant princess wedding in a mansion or ballroom. Incorporate some chocolate into your three tier cake by pouring chocolate fudge ganache over each of the tiers. Stack them together once the ganache has set and accent with berries and sweets. If you want more than just a hint of fudge, consider having a chocolate wedding cake. Regardless of the flavor and decoration, your three tier wedding cake is a classic size that will complete your reception.